Johnny Manziel is the latest hope for Cleveland fans. 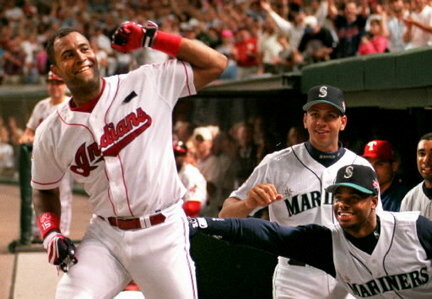 But 2 and a half decades ago, the arrival of Sandy Alomar helped create a new identity for the Indians that almost took the pressure off of every single Cleveland team afterwards. Plus Royals manager Ned Yost might be out of a job soon. Come on down to Cleveland town everyone on The Sully Baseball Daily Podcast. Edwin Encarnacion, Dallas Kuechel, Anthony Rizzo, Ryan Vogelsong, Ian Kennedy, Nolan Arenado and Alexi Ramirez all added to their totals for Who Owns Baseball. This entry was posted in Sully Baseball Daily Podcast and tagged 1995 World Series, 1997 World Series, Cleveland Indians, Joe Carter, Kansas City Royals, Ned Yost, Sandy Alomar. Bookmark the permalink.